My relationship with cashews began late in life. 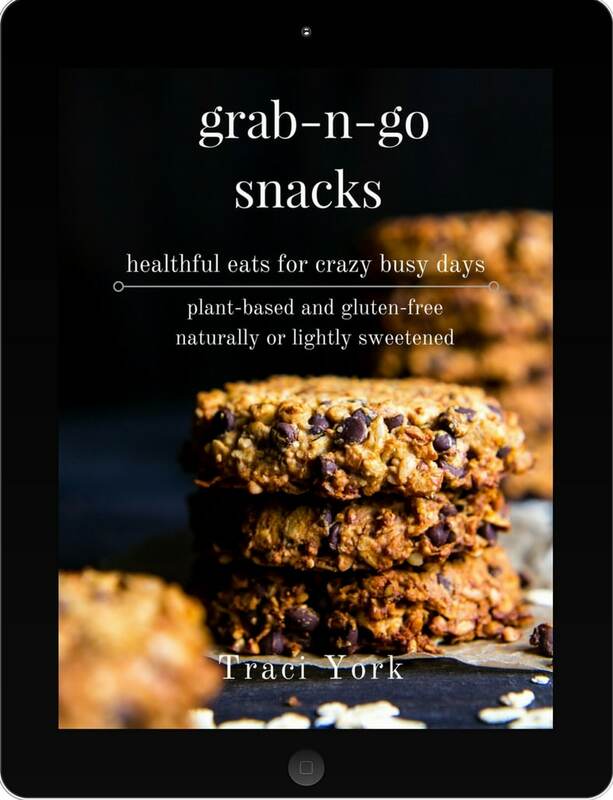 After giving up meat, I discovered many new foods in my efforts to eat a wider variety. Nuts were high on the agenda because they provide a powerhouse of nutrients, fats, and are an excellent source of protein. They’re delicious too. I always have cashews on hand and I continue to discover their versatility. Not only can they be made into Homemade Cashew Milk, but they can also be turned into cashew creme to make things like Dark Chocolate Cocoa Nib Ice Cream! I didn’t believe it either…. But because I’m such a big fan of cashews, why not have them on hand for a sweet and spicy snack? It didn’t take long before these Sweet and Spicy Maple-Roasted Rosemary Cashews made an appearance on a fall picnic. Roasted cashews are simple enough to make, but you need to keep an eye on them because they can go from golden (or darker – pictured here) to overcooked fast! 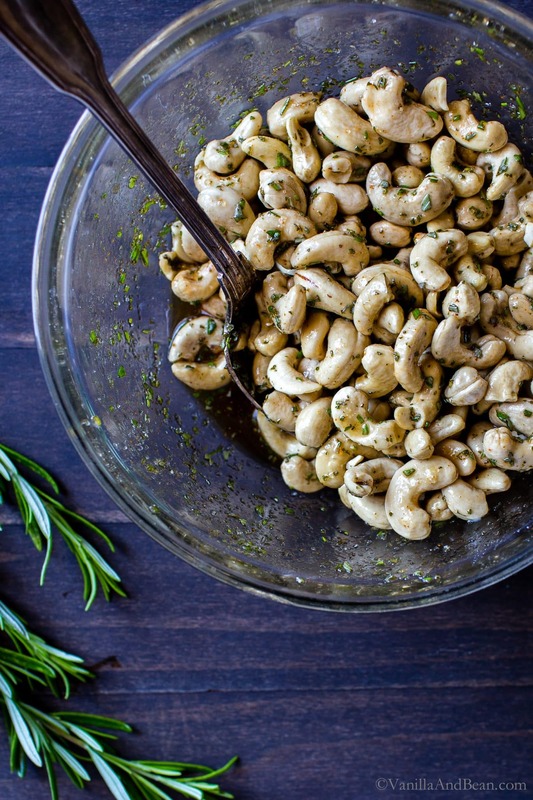 Sweet and Spicy Maple-Roasted Rosemary Cashews is such a tasty treat and simple y’all! They’ll disappear fast. You’ll want to keep these roasted nuts on hand for snacking, road tripping, or to take them on a hike. Doubling the recipe is easy peasy too if needed! Chop the rosemary into little bits. 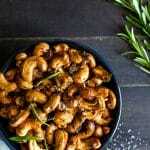 In a bowl mix the raw cashews, oil, maple syrup, brown sugar, salt, spice and fresh rosemary. 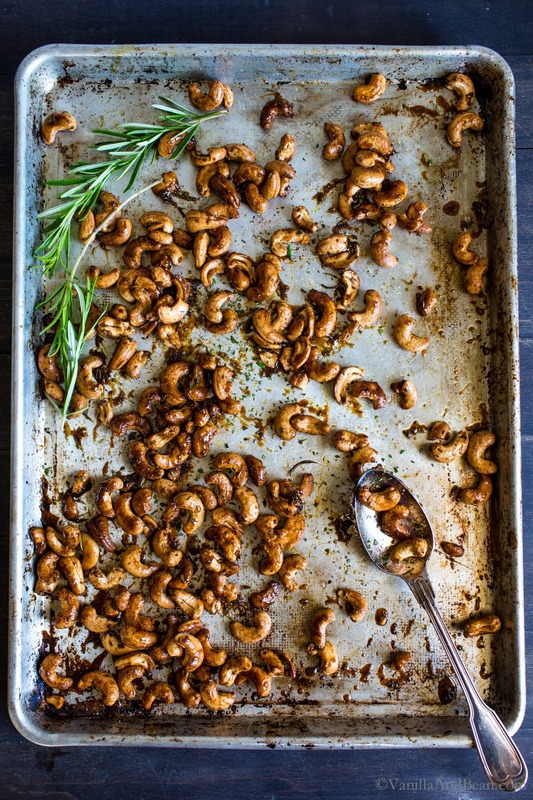 Pour the cashews on a sheet pan and roast until lightly golden, or dark gold (pictured here). Sprinkle with more salt and fresh rosemary then turn out on to a piece of parchment paper. Separate the nuts so they aren’t sticking and allow to cool. Store in lidded jars until ready to use. Super simple and fun to have on hand for snackin! Use fresh rosemary. It makes all the difference. Look for cashews in the bulk bins. They’re more economical and you can refill that old large container you saved. Sweet and Spicy Maple Roasted Rosemary Cashews roast fast – in about 15 minutes. Keep an eye on them after the 10 minute mark and after stirring. They can go from golden to over caramelized fast. 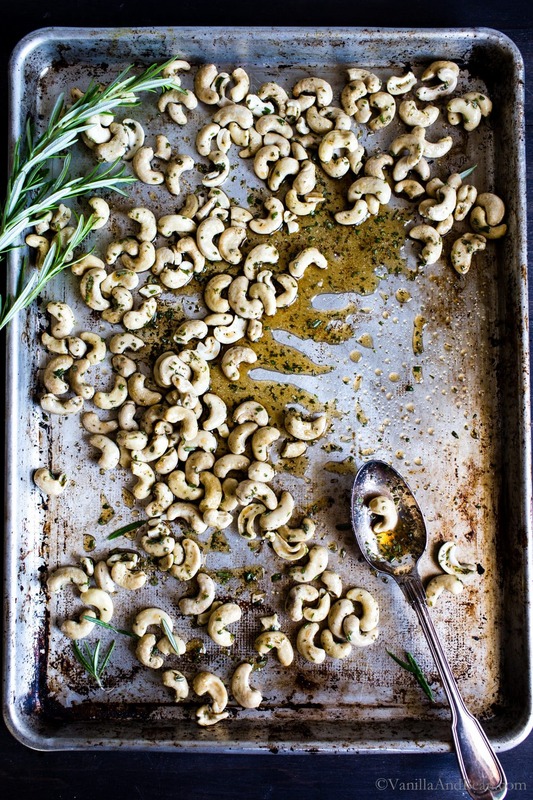 After pulling the cashews from the oven, work quickly to transfer them to a piece of parchment paper, sprinkle with salt and more rosemary, stir, then separate the nuts, else they’ll stick together or break apart after they cool – we want to try and keep the cashews whole. This recipe makes fabulous gifts. Cool the roasted nuts completely, then fill small Ball jars and lid. The jars can be tied with ribbon and be used again by the recipient. In a mixing bowl add the raw cashews, warmed coconut oil, maple syrup, brown sugar, 1/4 tsp salt, cayenne pepper and 1 Tbs rosemary. Toss well to make sure the nuts are evenly coated with mixture. Roast nuts on an ungreased sheet pan for about 10 minutes, stirring and turning pan 1/2 way through roasting. Roast for another 5-8 minutes if needed, or until golden. I like to push these nuts to make them dark and caramelized. Keep an eye on those last 5-8 minutes, though because they can go from golden to too dark fast! The nuts pictured in the blog post are more golden then caramelized. 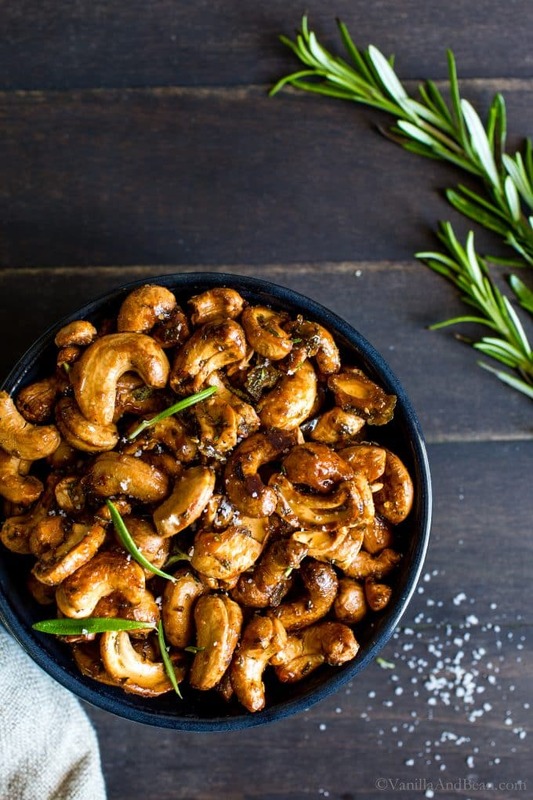 Immediately after removing nuts from oven, sprinkle with remaining salt and fresh rosemary, give them a stir and pour on to a piece of parchment paper. Gently separate the nuts that are sticking together. Serve slightly warm or at room temperature. Store in a covered container for up to a week. Adapted from Ina Garten's Roasted Rosemary Cashews. *Photography and video updated 10/18 to show how fabulous these roasted nuts are! Thank you for reading! 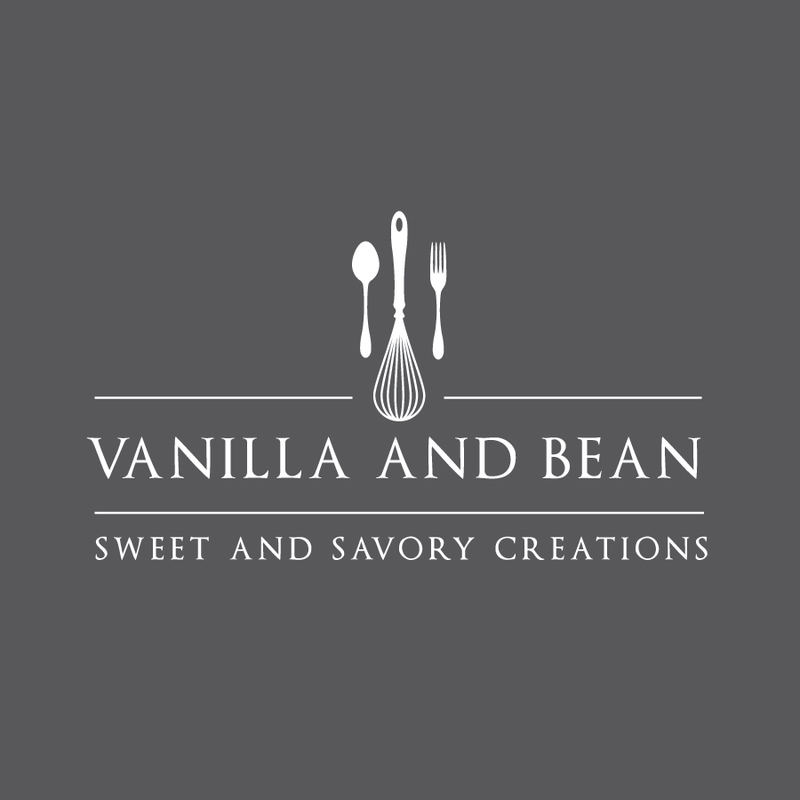 If you make this recipe, or any others on Vanilla And Bean, be sure to post it to Facebook or Instagram, notify me @vanillaandbean and tag #vanillaandbean! I’d love to see what you’ve made! Also, if you like my content, please share it with friends and family and follow me on Instagram, Pinterest, and Facebook . Thank you! Easy and delicious. I use olive oil instead of coconut oil. I recommend using Dorset Maple Reserve Vermont Smoked and Spicy Maple Syrup (or similar) in lieu of maple syrup and cayenne. Hi Sally! Thank you for your note and tips. That maple syrup sounds amazing! So glad you enjoyed the cashews! I made these on Christmas Eve and they were so great I gave quart mason jars of them away for gifts. LOVE these! Another HIT from Tracie! Thank you! Thank you for your note, Nancy! What a fabulous gift… so happy to hear you’re enjoying the recipe! These are absolutely deadly! I used olive oil instead of coconut oil (less unsaturated), and these were absolutely unbelievable. I am glad I made them as a gift, otherwise I would have eaten them in one sitting. Thank you so much! Hehe! Thanks so much, Al, for coming back and leaving a note! So happy to read! Hi Chris! I hope y’all enjoy them! Love these cashews Traci! So perfect for the upcoming holidays. And great for holiday gifting too! LOVE the videos! Oh yeah, you know I love those foodie gifts, Mare! Love the new photos and the video! You KNOW this is one of my favorite recipes. I bet I’ve made it more than you. Ha! Traci, these are hands down always part of my appetizer menu for parties and are so popular. I have shared this recipe many times. I usually triple the recipe and I still find myself wishing I made more! Sweet, spicy, herbaceous-it hits all the right notes! excellent, easy to make, and gone in an instant. Thank you! Girl I can’t even tell you the sounds that just came out of my mouth because they’re barely human. Just guttural moans. Because ROSEMARY! So happy you added these to my FBC call out. I checked on mine after 10 minutes and i’m glad I did! The ones on the edges were beginning to burn. It was perfect timing though because even the ones with black on the edge were delicious. I also added Chia seeds for extra nutrition. Thanks for the recipe! Oh, that Ina recipe is my absolute party GO TO. I like the twist on ingredients–will have to give it a try next time! These seem like the perfect thing to snack on while I write! I can use all the extra (delicious) protein-filled energy-boosters I can get. I have to portion mine out, else I’ll eat way too many! It’s the rosemary with maple… so delicious! i love cashews. I am definitely going to try your cashew creme ice cream recipe! Right after I try these babies. Sweet and spicy is my jam. By the way, I wish I had half of your photography skills! I need to make a batch of these immediately!! 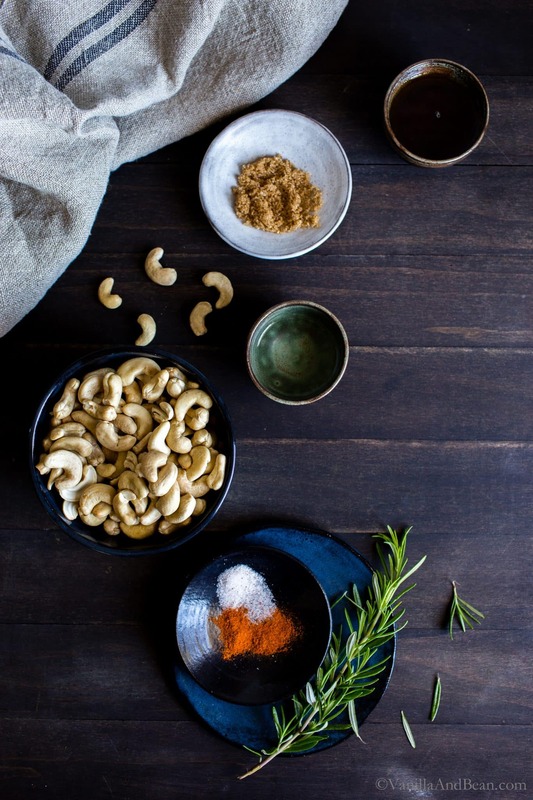 Cashews are one of my favorite kinds of nuts – I love their slightly sweet taste – and you’ve made them look even more amazing with these wonderful spices!! Salty + sweet is one of the best combinations out there, so I’m sure I would devour these. And beautiful photography, Traci!! I discovered cashews a few years ago and was always too poor to afford them – so I’d basically dance around the supermarket when they were on offer because they are just so good. I LOVE cashew creme based anything and home roasted they are simply divine! Love the flavor combination of maple and rosemary – never would have put them together! These are seriously the most unique spiced nuts I’ve ever seen! :) Loving the process shots. Thank you, Medha :D They are tasty! The buttery flavor of the cashews still come through despite the bit of sugar and spice. I hope you enjoy the recipe! These look like they’d be dangerous! Love spiced nuts, Traci. Never thought of making them myself so looking forward to trying these! Roasted nuts are so phenomenal and I never think to make them at home, but then always find myself drooling whenever I pass those stands in the mall or at fairgrounds. You know the ones. Yes- perfect football snack!